Today we are thankful for all the volunteers, well-wishers and supportive people who have helped us in the search for Sassafras. We truly wish you and your families a very happy Thanksgiving, and we are comforted to know that so many people are wishing for our family to be able to bring Sassafras home. We asked Sam and Salsa to come check Chevy Chase Circle for us today, hoping that it was still an active enough site for Sassafras that Salsa could pick up a scent there. Unfortunately, in three loops around the circle, Salsa didn't find any trace of Sassafras. Sam was quick to point out that we've been having the coldest weather Sass has faced, and that the Circle is open and paved, making it a cold spot -- and thus sort of unattractive to a dog trying to stay warm. It's possible that the cold will limit Sass' roaming a bit, if she's found a warm place to den for a bit (although it is unlikely to change her overwhelming pattern of movin' on all the time). Sam, after finishing at the Circle with us, was on her way to check on a sighting of Olivia - so we really hope Salsa was able to confirm that sighting. A bunch of volunteers took flyers today, and we're re-flyering and updating in the Chevy Chase neighborhoods where Sassafras gets spotted the most in addition to the eastern side of Rock Creek Park. Thank-you! Please keep thinking good thoughts - this would definitely be a week we'd be thankful to have our Sassy girl back home with us. 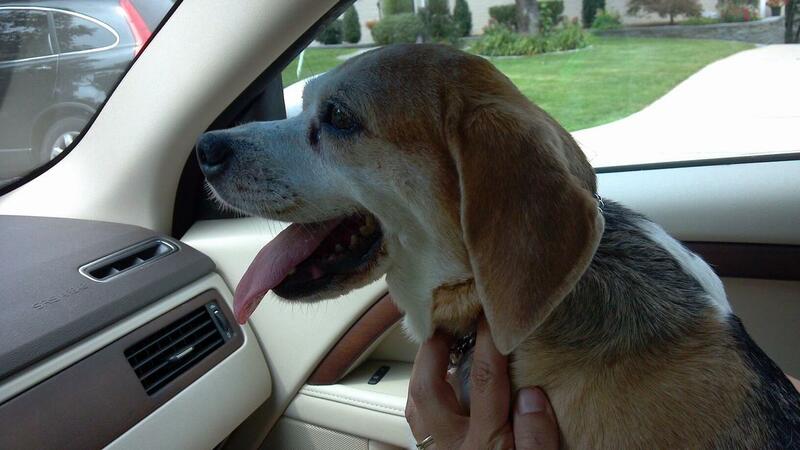 Bayla, a beagle mix who was lost for 45 days is now back home! 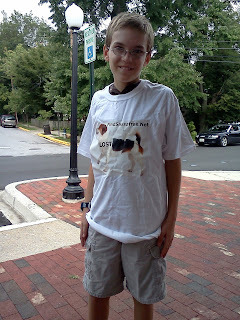 We're so happy for Bayla and her humans! Hearing about happy endings is always a good thing, and keeps us hoping that Sassafras' story will have a happy ending, too. Sassafras has been on her own for 221 days. This past week marked the one year anniversary of Olivia's being lost in DC. Olivia is sort of special for us because the first weekend Sass was lost, one of our volunteers met Olivia's human (Laura) while hanging flyers. Laura set up this blog, and our email account before we ever knew we'd need them. She gave us invaluable help and support those first few weeks. Bogey and Bayla are still waiting to be found, too. Whenever Jeff and I have been lucky enough to get some press coverage we try to mention other lost dogs and owners who need help just as much as we do, but those stories often don't make it to the page or the TV. I know Laura needs help this weekend. If you're in the DC metro area, and have some time to donate I know she'd appreciate it. The weekly paper has a story of Sass this week. We hope, as always, that this will mean the right person will have her picture and our phone number at the right time. Thank you to Lisa and Debra, who also spoke to the reporter and thus helped get this story from idea to actual print! Technical Expertise Needed - Webcams to look for Sassafras? Why are we asking this? We're trying to figure out if we can set up a monitoring station at Chevy Chase Circle, where we think Sass might be going for water. This involves us getting permission from multiple authorities and we are making progress (and are happy to report that the chief of police in Chevy Chase Village is willing to help). What we don't know is whether a webcam might be a good solution, instead of our current cameras (which require someone to come out and manually check them). Some of the problems we anticipate with a webcam at the Circle are keeping it powered, hooking it up to the internet, and making sure that if Sass appears that someone sees it (a particular concern if she comes by at 3AM and nobody is online watching). 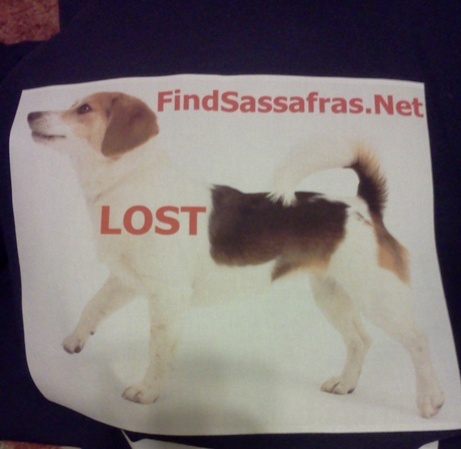 Have a suggestion for setting up a live webcam for finding Sassafras. Is there any way you could find a few homeowners or sympathetic business owners who would not mind having a streaming internet webcam setup on their windows? It would only cost them some (small amount of) bandwidth on their internet connection, which you could compensate them for, if they asked for it. You can get inexpensive webcams with a built-in webserver (no computer required) from anywhere from $40 and up. You can have the cam running a live feed 24x7. People on the internet can log into these cams and watch for your dog 24x7. Since it's real time, you can act on any sighting much faster. I have setup these myself. They're not hard to do. All you need is someone willing to put these security cams on their windows/doors and allow you to use their internet connections. Walking my dogs at about 11:30pm, it might have been a fox, but just in case it wasn't... something about the right size and with what appeared to be a white tail (something the foxes don't have, but it might have been the effect of the strange color of the street lights) ran across West Lenox Street at the intersection of Cedar Parkway where it goes through a right of way to the Chevy Chase Club golf course. The foxes go through there, so there must be appropriate sized openings. 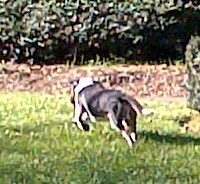 Beth, Sam and Salsa are now on an active track based on a Thursday sighting at Colombia Country Club. This means that Salsa (the tracking dog) has confirmed that it was Sassafras at the club on Thursday. The track has just started (and it sounds like they are currently headed toward downtown Bethesda on the Georgetown Branch Trail)... more details about where it went when it's over. We're highly likely to be asking volunteers to help with flyering and other efforts tomorrow.... Fingers crossed, toes crossed that we might be bringing Sass home soon! 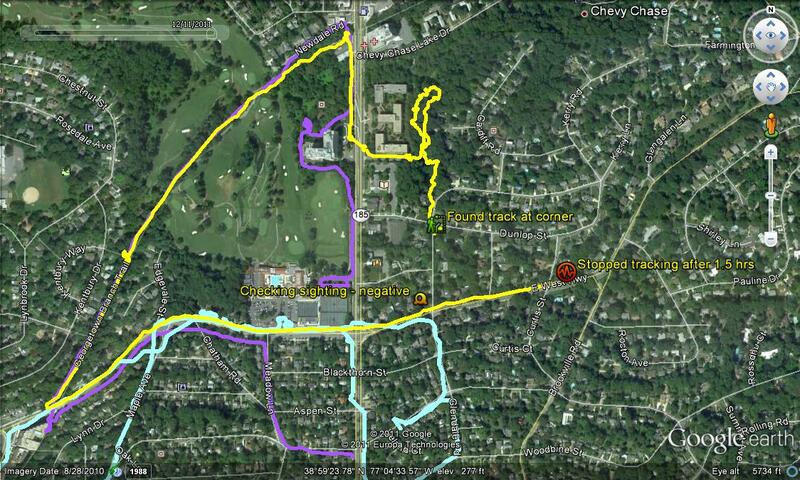 A dog walker thinks he saw Sassafras on the grounds of the Columbia Country Club (see map). The dog he thought was Sass was with another dog, and he chased them for 30 minutes, before losing them when they left the grounds of the club, exiting onto Connecticut Ave, headed north towards Kensington (and the parks that connect to Rock Creek Park). If it was Sassafras, he was pretty sure that she was no longer wearing a collar, which would be too bad, as it has all of her identification. (She is microchipped, so she can be identified without the collar by a vet or shelter with a scanner.) He did say the dog looked happy, and healthy. It's so frustrating to get a call like this when we can't get over there - jobs, traffic, and daycare pick-ups all have to be figured into what we do. I wish he'd been able to call when he first saw them, and just kept them in his sights so I could have gotten there before he lost sight of them, or that he remembered to take a picture so I could maybe see if it was Sassy or not. Sam and Salsa will check this one out, so we will know on Saturday morning whether or not it was her. Jeff and I have done a number of interviews with the local TV stations, newspapers, online blogs, and Anderson Cooper. 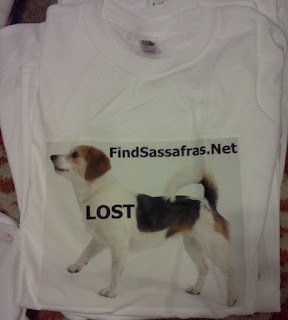 Every time we do one, we hope that the right person will see it and help us bring Sassafras home. Simply put, we have high hopes. When the miracle phone call doesn't happen, those high hopes have to go somewhere, and there's no where to go but down - and we have some days where we are very sad because we haven't been reunited with Sassy, and that despite all our hard work and working outside our comfort zones (we are not TV people! ), we still feel like we've failed her. It's always hard to think about what to do next, and work up the energy to actually do it. We have, by no means, given up our search, even though we're kind of quiet right now. We're just conserving our energy, and getting ready to start again. We've speculated from the first night of searching that Sassafras would be drawn to Rock Creek Park - it has food (picnic areas, small animals), water and vegetation and other natural formations that would offer shelter. It makes our search much more difficult, though. Not only is Rock Creek Park about 1700 acres (2000 acres if you include all the local contiguous parks), it is part of the national park system, and we cannot post any flyers in the park. We've asked as many people as we can to hand out business cards with our information and Sassy's picture, and we post flyers on the streets along side the park. We hike along the trails we used to hike with Sassafras to put our scent down, in the hope that this will make her stick to the area where we've tracked her. Also part of the challenge? Much of Rock Creek is down a ravine, so cell phone coverage is weak. People may not be able to call us as soon as they see her, and even if they can, they cannot always pinpoint exactly where they are on a trail. And yet, despite how much more difficult it makes it to find her, I am glad that we know she uses the park since I see cars as the #1 threat to her survival, and there are fewer of them there than anywhere else she could be. On Friday, we received an email about a possible sighting in Rock Creek Park on Monday, October 3. Q: How often does Sassafras have seizures when not on medication, and what type of seizures are they? 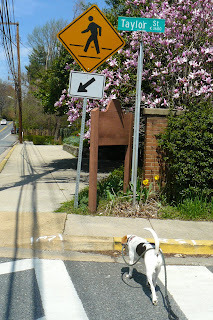 Q: What neighborhoods or parks does Sassafras know the way home from? Q: What should I do if I see her? Q: How much money have you spent? Q: Help! I’ve lost my dog! What should I do? If you have other questions we haven't answered, comment below and we'll do our best to answer in a future post. Jon Hussey's documentary from early August about our search now has more than 3,500 views. Still hard for us to watch, and really well done. We were finally able to follow up on the last track and post flyers in the DC neighborhoods of Brightwood and Shepherd Park. Huge thanks to Kerstin, Debra, Debbie, Dee, and Shelia who came out on a cold and rainy day to help! The producers have emailed us to say the definite air date is Friday. It hasn't shown up on the website, yet, but we'll link when the announcement is there. This morning's track with Sam and Salsa was negative for Sassafras, sadly. We're disappointed, of course. We'd really like to bring Sassafras home. It's hard to think of her not being there for all the family-centered holidays coming up because she's definitely part of ours. We received a call at 6PM that a woman had seen a dog that could be Sassafras at about 5PM. The sighting was in Rock Creek Park, just over the bridge from the small parking lot near Jones Mill Road and Levelle Drive in Chevy Chase. This is a little bit north of where Sass was last tracked, but certainly within the realm of possibility. The woman who saw the dog has looked at the blog and thought the dog was proper weight and similar in appearance to Sass. She described the dog as a healthy beagle who was tracking something and not overly interested in the sighter (or her dog). The sighter saw no other people walking dogs (the area is known for people sometimes allowing their dogs to walk off leash, but the sighter waited awhile and no one came by). She did not notice whether there was a harness or collar. She did think the dog looked like a full beagle, (Sass is not a full beagle which is most noticeable in her ears), so we are hopeful but not certain about this sighting. We do want to check it out with Sam and Salsa. We're going to do some flyering this Sunday in the neighborhoods on the east and west sides of Rock Creek Park. Some of this will be new, and some of this will be checking on flyers that may have come down in all the rain we've been having. If you can help, please send us a note at findsassafras@gmail.com! The phone has been frustratingly quiet, but because of all the rain we've been getting we probably should not be surprised. It has been nearly six months since Sassafras was lost, and our hearts are still aching from her loss, but we still hope we can bring her back home. We are incredibly grateful for all the support we've received from people - I can't express that enough. We will be trying to do some maintenance work this weekend on flyers in neighborhoods she is known to frequent, and putting up more in new areas on the east side of Rock Creek Park. In addition to these ongoing flyering efforts that reach out to the community for their help, Jeff and I have been sleeping on a cheap set of sheets - if we get a good sighting that we can get to quickly, we can leave strips of cloth with our scent behind to try and encourage our girl to stick around. Crossing East West Highway a little east of Grubb... Sighter is our new volunteer Hugh who is trying to go out during the wee hours of the morning. He didn't get a great look at the animal, but this is certainly near recent tracks. We are still waiting for confirmation of an airdate, and we will post as soon as we have some information! Update: We are being told the segment will air on 10/5/2011. It is another rainy day in the DC area. Generally, this means that people are not out and about making it less likely someone will spot her, but it also means Sassy may not be out. If Sassy isn't out then when the rain stops she's more likely to be moving around looking for food, so please keep your eyes open when the rain goes away! We're working on updating/revising the FAQ. If you have questions you'd like answered or clarified let us know. Yesterday afternoon we received a call that Sassafras may have been sighted at 3:45 AM that morning crossing Connecticut Ave traveling east to west on Leland Ave (2 blocks south of East West Highway). 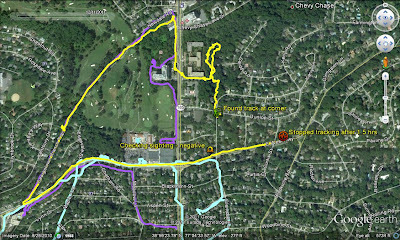 Yesterday's track took us for the first time into territory we used to walk with Sass before she was lost, namely portions of (the east side of) Rock Creek Park between Sherrill Dr. and Candy Cane City. Track Will Continue Tomorrow! We Will Need Volunteers to Help Flyer! Jeff is home from the track and pulling his notes together to put up a map - he'll update this post with that later tonight. 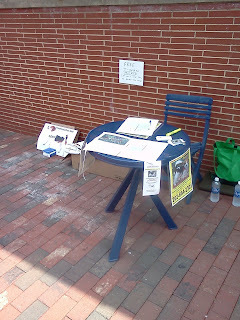 Again, since this is new territory, it will mean a new flyering effort tomorrow and into the week. If you can help tomorrow (Sunday) afternoon [meet up time will probably be about 2 p.m.] or if you have time during the week, please send us an email at findsassafras@gmail.com. The Wednesday night sighting of Sassafras at Candy Cane City has been confirmed by the tracking dog, Salsa! This is the first time we've actually had a confirmed track in Rock Creek Park, so it's new territory! Jeff and I were invited to be on Anderson Cooper's new daytime talk show, and our segment was taped this week. The documentary that Jon did will also be featured (he was there, too!). We are unsure of the air date, but will post it as soon as we know. Everyone involved in the show was incredibly supportive and they are excited to help get the word out! We cannot thank them enough for the opportunity they gave us, or the experience. We received a call this evening that a nine year old playing in the woods near the tennis courts in Candy Cane City* saw a loose dog zoom by around 6PM, running on the path. I talked with his mother and then directly with him. He couldn't tell whether the dog had a collar or harness on... it was all pretty fast but he thought it was Sass. We've always suspected that Sass would be in Rock Creek Park, but never been able to confirm a sighting there... It's possible... If folks could get the word out to the regulars in that area to be on the lookout, and have their cell phone cameras ready, that would be great. If it was Sass and active in daytime, with enough eyes looking out, we may start getting even closer to bringing her home. 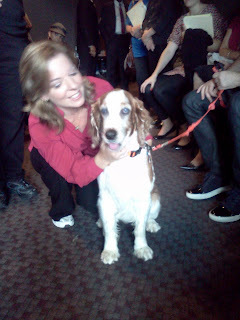 TODAY show web site - "Is their lost dog a lost cause? Internet cries no!" Hard to fathom that our Sassafras is garnering national attention, as in the new (and very well done) TODAY show web post. But even though they’re exhausted, how can they stop searching for Sassafras when so many big-hearted strangers haven’t? We just want Sass back and everyone's support has been so appreciated. Please do read and circulate the article. It does a great job of highlighting the efforts of those involved in the search! 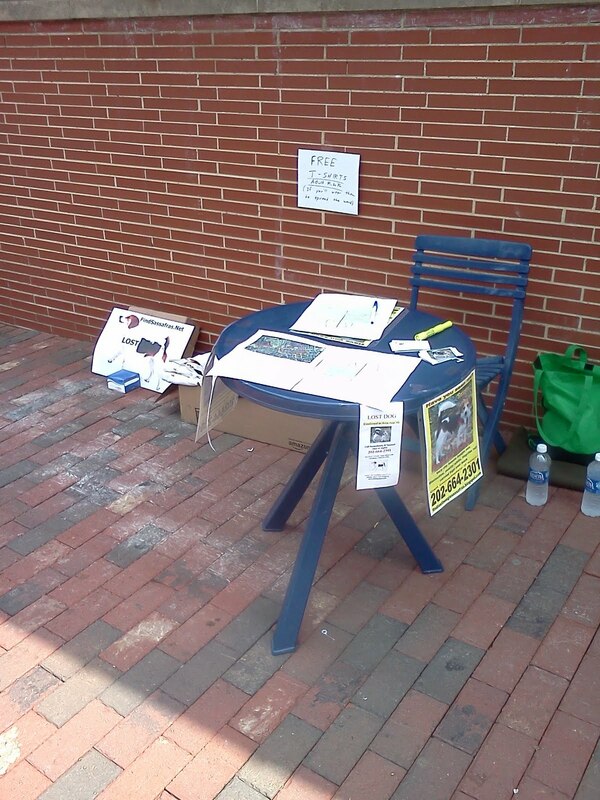 Today we sat out at Brookville Market to spread the word and 8 great volunteers hung new posters and placed flyers on car windshield the area... There were many supportive and interesting people checking in at the table at the market, and a couple new enthusiastic T-shirt wearers... See pictures below and thank you to everyone! Please keep spreading the word! Salsa is tracking Sass' scent on Connecticut Ave. right now! Sam and Salsa came out tonight and checked the Glenwood Cemetery sighting - it was not Sass. As always, our thanks to them for all their good work. Thanks also to the couple who called with this sighting, because they came out tonight to show us exactly where the dog walked so Salsa's could sniff the right spot, and we would know if it was our girl. Jeff just called to say that they are on their way over to check out the other sighting that was called in recently, on Brookville in Chevy Chase. We're pretty sure that Sass has walked Brookville, so if Salsa picks up a trail we hope she pulls on the leash - she will often pull more if the trail is fresh. A group of kids just called to say they'd seen Sass very close to our last confirmed sighting. According to them, they saw her yesterday (or maybe the day before) on Brookville in Chevy Chase, between Taylor and Shepherd. Kids are great spotters, but they also make a lot of crank calls to our phone, so it's hard to know if this is for real, or not. It would certainly be unusual for Sass to still be in the same neighborhood - she's a traveler and doesn't stick around. But just in case, leave your gates open and cook things that smell good, Chevy Chase! We hope that as the rain wanes, our Sassy girl comes out where someone can see her! A couple of months ago, we posted flyers in Chevy Chase Village (CCV) and the police called and asked us to take them down. We did. Since then we've asked all of our volunteers to look at the map, note the boundaries and refrain from posting flyers there. Our most recent track of Sassafras went through CCV, and we believe it could have been daylight when she walked there, so we tried a different tactic to reach the members of the community - a small hand out that read, "Lost Dog / Please help us bring her home" with a telephone number to call, the blog's address, and photographs of Sassafras. The police have informed us that they have received complaints about these handouts from members of the community, so we are asking those near or in CCV who spot a handout to please remove it. The individuals in CCV that we've met over the length of the search have uniformly expressed sympathy and concern for Sass' loss, and we'd really like them all to know how much that is appreciated. For those who were angered by our handouts, please accept our sincere apologies. Anyone who lives in the area or who is on a listserv that serves it, please help us get the word out by posting details and talking with your neighbors. Mark Segraves and camera man, whose name we missed, from ABC 7/WTOP were out interviewing us today and expect a segment at 5:24PM this evening on ABC 7, and then running throughout the evening and early morning on WTOP 8 (cable). They were great and we appreciate their interest. We'll post links when up (...assuming we don't get bumped). Given the media attention, the phone is starting to ring with possible sightings, one of which has already been disproven. We'll keep updating this page today, so please come back frequently, and if you have ways to help us determine whether these are likely (in other words, you live in the area or could contact listservs), we'd appreciate the help. 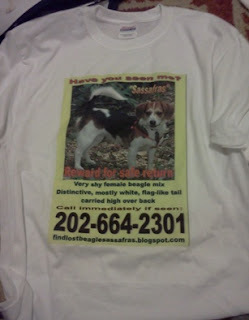 A nice gentleman called that he's seen a beagle for a few months in the Brookwood estates area of White Plains, MD. About 10 days ago the dog was in his back yard playing with his Yorkies, had a collar on, but would not allow itself to be caught. Last seen 3-4 days ago. Likelihood: We think unlikely. Would mean other local sightings were wrong, but hard to rule out. He was looking directly at website and video and still thought it could be Sass. We hope to stay in touch. SATURDAY - 5:30 PM - NE DC - Fort Myer construction depot entrance at the end of Adams St. NE (just off of South Dakota Ave at 32 St.). From Anne: "Saturday around 5:30 p.m. when we saw a beagle mix that very closely resembles the photos on your web site. She also seems to be the right age at about 3.5. At the time, we did not know the whole saga of your search but we are dog people and we tried to get her to come to us with the turkey jerky we had. She had no collar on and was alone so we thought she was lost and that's why we pulled over. She was at the entrance to the Fort Myer construction depot entrance at the end of Adams St. NE (just off of South Dakota Ave at 32 St.). When we approached her she retreated behind the locked gates of the Ft Myer construction. But she did come out to get the turkey jerky! We didn't think to snap a photo but I suspect she is staying there because she knew just how to get behind the fence there and seem to know her way around. Also, she seemed well fed and healthy so maybe someone at Ft. Myer picked her up at a construction site and brought her there where they feed her. (Just a theory). I will take a walk up the street with the camera to see if she is still there." Likelihood: Low because Sass has not been confirmed on that side of town, but certainly could get there. The Washington Post was out Friday interviewing us, and then followed along for flyering efforts. Story is now online, with a 5 photo gallery. Today's paper version of the WP has a teaser on the front page, below the fold. If you have seen this video, then you know how precious the things are that we love, and the lengths to which we would go to have them back again. A caller thinks he might have seen Sassafras yesterday near Kensington Pkwy and Iverness Dr in North Chevy Chase. The dog was barking at a mailman about 2-3 p.m. in the afternoon. We'll be trying to find other people who saw the dog to try and get a better description. Willing to take the shirt off your back to help us find Sassafras? Well, no need to do that, but if you'd put a shirt on your back and wear around, we'd greatly appreciate it... especially if you live or work within the Chevy Chase to American University corridor (where we think Sass may now be roaming). Thanks to super volunteer Mark, who has made about 18 of these, primarily size Large male (but there are a couple M and XL). If willing to help out, please send us an email with your name and address (and T-shirt size) and we'll get one in the mail, or find a way to deliver! We're hoping for a good number of volunteers this weekend to help us put small flyers on cars in the neighborhoods where we think Sass was headed. While we always wake up and hope that today will be the day we bring her home, we have more hope when we've got a good sighting to work from. 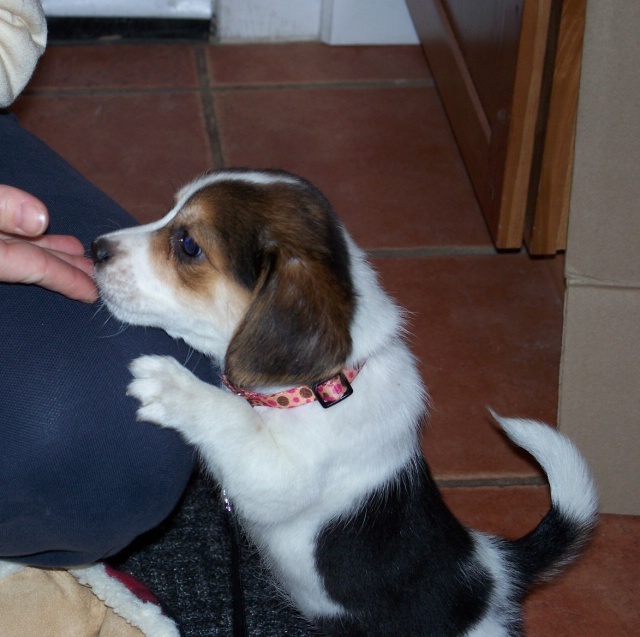 Speaking of the day we bring Sass home, here's a puppy picture, taken before we got to bring her home. She's the prisoner on the left. If you think you can help, email us at findsassafras@gmail.com, and let me know when you're available! Here's the track from Tuesday night, based on a sighting Sunday afternoon. The yellow and light blue colors are from earlier tracks, so you can see this is a visited area more or less. We are still waiting for the map of the track from Sam, but I had a long conversation with her today about what we could do next. Sam doesn't feel we'll learn much of anything from continuing the track - we're days behind her, and won't catch up to her, and we know some of the broad outlines of her territory, so we can reasonably assume she's going to end up (or already is) in the neighborhood of American U. She did suggest that we try new ways to get the word out - the flyers are good, solid ways to let people know, but she thinks that maybe the search could benefit from people having the information closer to home. In other words, we're going to be asking for volunteers to put small flyers or business cards on car windshields in the targeted neighborhoods, and/or put them between the doors of houses. If we're lucky, the next house Sass wanders into will then know where the phone number is to call, and won't have to go looking for it. Sassafras is walking down the sidewalks, into yards, and people must be seeing her, but they aren't calling - we just haven't connected with them, yet. We need someone to call and say, "she's in my yard right now!" Want to help? Shoot us an email at findsassafras@gmail.com. 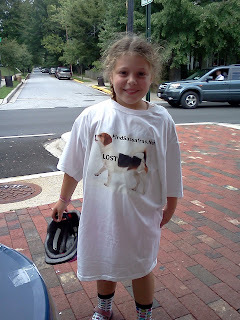 Sassafras Tracked to Chevy Chase Elementary School [update] and then down Connecticut! The sighting that was called in yesterday was Sassafras! Sam and Salsa are on the job right now, and we'll have a map up tomorrow. 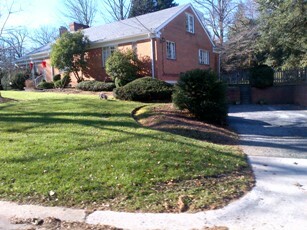 She is back in Chevy Chase, and walked right by Chevy Chase elementary. Jeff has put up lots of flyers there and spoke to the principal tonight. Please keep your eyes open, call us if you see her and take a look at our post, What to do if you see Sassafras. We would love to bring her home! She did not see the dog's face, but only from behind and above, and felt it looked like Sass' picture. The dog she saw had on a harness (she did not notice color) and she waited for what she felt was long enough to determine that no human was nearby. The dog was headed west (she thinks). This is in the category of one of the very hard calls to react to. We don't live in the neighborhood and when we called the person back, there was no answer. If anyone lives nearby and has more details, please let us know. It's been many weeks since we've had a sighting, and, as you can imagine, it's difficult for us with the heat wave, earthquake and now a hurricane on the way. We have had some telephone calls from people, and we appreciate every single one of them, even if the dog isn't Sass. It means our flyers are up, people are seeing them, and there's still a chance that the next call with be her. The good news in our email today is that Peanut, who went missing nearly a month ago, has turned up at a shelter and is being reunited with his people. Because we have so many great posters up, we received a call this morning that a beagle wearing worn tags with the name "Dixie" was spotted around 8AM in the Bannockburn section of Bethesda. We were just about to approve a craigslist ad about Dixie to try to get the unknown owner in touch with the caller, when the caller phoned me to say that she had gone back again to look for Dixie. The caller captured Dixie and returned her home safely. Perhaps with your help. Now at 250 views on vimeo and YouTube.